The most common species of quail, the bobwhite is often referred to as the number one game bird of the southeastern and mid-southwestern United States. The name “bobwhite” derives from the bird’s characteristic whistling call. Males have a white throat and brow stripe bordered by black compared to brown colored females. Throughout the quail range, nesting cover, winter cover, and brood rearing cover are important factors which influence populations with good nesting cover is the single most significant factor for healthy populations. Quail generally forage twice a day, in early morning and mid-to-late afternoon. They eat a wide variety of foods including insects, seeds, leaves, and berries. Young birds also feed very heavily on insects, gradually shifting to a greater proportion of seeds as they near adult size. 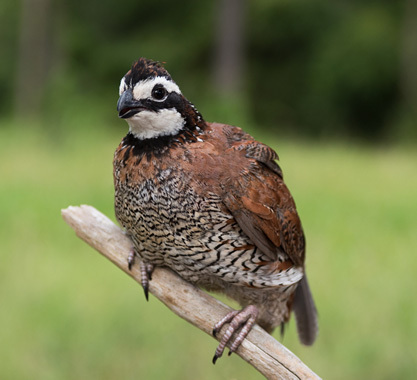 Typically, quail are found in small flocks, known as “coveys.” In late spring and early summer, coveys begin to break up as males and females pare up prior to the breeding season. Quail spend most of their lives in a relatively small area, with groups of 8 to 25 birds common in a single covey. The flight speed of Bobwhite quail is 30 to 40 mph. The beginning of the National Amateur Quail Championship’s history actually defines the beginning of amateur championships in field trials. Its inception is grounded in the formation of the Amateur Field Trial Clubs of America (AFTCA) when in 1917, six clubs came together to launch the first annual championship of the AFTCA. 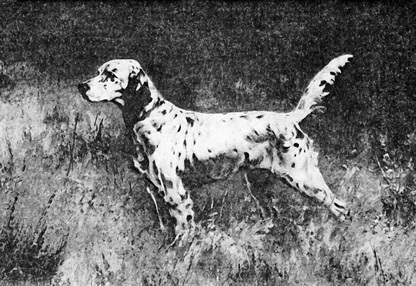 It was open to setters, pointers, and pointing Griffons who had placed first or second in an all-age trial or first in a derby stake held by a licensed club and were handled by a bonafide amateur. The stake originally featured a one-hour first series followed by a second series with dogs and time at the judges’ discretion. The membership of the of this new organization was comprised of the New York State Field Trial Association, Pointer Club of America, Delaware Setter and Pointer Club, Virginia-Carolina Field Trial Association, Page Valley Field Trial Club, and the Connecticut Field Trial Club. The importance of this seminal event was reflected in Samuel G. Allen’s choice of Tiffany & Co. of New York to produce a handsome silver cup to be awarded to the first National Amateur Champion. The trophy was described as a work of art worthy of being placed in the cabinet of any connoisseur. The first National Amateur Championship was held in Thomasville, NC, on January 14, 1918 and a bad weather delay reduced the starting field from 12 to seven. The winner was found in Fairy Beau, a blue belton and tan ticked setter dog, owned and handled by Harry D. Kirkover. Beau had 12 all-age placements to his credit at this point and he had also been a success on the bench. The 45 lb. “near Llewellin” notched 2 finds in the first series, one find in the second series and an all-age race to garner this first amateur title. In the early years the Championship was held primarily in the southeast. By the mid ’50s it had been run in the following states: Georgia, Maryland, North Carolina, South Carolina, Virginia, Illinois, Kentucky, Missouri, Oklahoma, Alabama, Arkansas, Mississippi, Tennessee, Texas, and California. Through this time the number of AFTCA clubs grew to 46 by 1928, 74 by 1941, and there were 163 clubs by 1953. 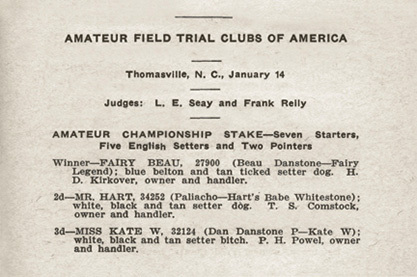 In the early years, the National Amateur Championship was the only chance for members to show their dogs in a championship trial. By the late ’30s the desire for opportunities to gain the title Champion by competing closer to home became the impetus for the formation of regional events. This same growth evolved into new amateur championships contested on different upland game birds. It was necessary for the National Amateur Championship to become the National Amateur Quail Championship, as the scope of National Amateur Championships was expanded to pheasant, sharp-tailed grouse, woodcock, ruffed grouse, chucker and prairie chicken. These now included events for shooting dogs as well as all-age competitors. Today the National Amateur Quail Championship enjoys the longest history in our sport. Presently, qualifications for competing are either placement in a one-hour, continuous course all-age trial or a first place placement in a 30-minute all-age event. The dog must be owned and handled by an amateur handler. Heats of one and one-half hour assure the quality of this historic and prestigious titular event. In 1959, past AFTCA President, Field Trial Hall of Fame member, and National Championship judge, Cecil S. Proctor spent months planning for what he described as the “greatest quail event in the history of the Association” (AFTCA) to be contested over Dixie Plantation. Since 2007, Dixie Plantation has hosted The National Amateur Quail Championship. Dixie, with its wild birds and history in the horseback field trial world is a fitting home for this glamorous competition.